The practice and the business of medicine change on a daily basis. There are always new research breakthroughs or new compliance requirements. In hospitals, everyone appreciates the urgent need to share information quickly and efficiently. Unfortunately, fast-paced information sharing is not always consistent with federal copyright laws. Compliance is not as simple as writing a policy or reaching an agreement with a single publisher. Carefully drafted corporate agreements may still fall short of covering the vast stores of copyrighted material that populate the information workplace. 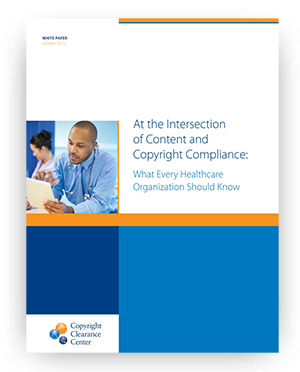 Download the whitepaper At the Intersection of Content and Copyright Compliance: What Every Healthcare Organization Should Know and see how your organization can facilitate a culture of compliance.